Brussels sprouts hashes are one of my favorite dinners to make because they're fast and full of greens yet taste like comfort food. 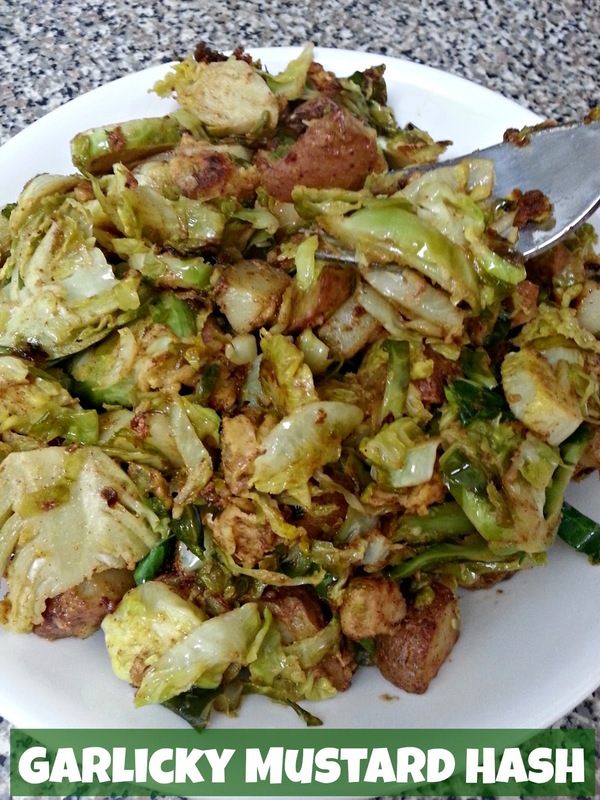 I've already shared my Brussels sprouts & quinoa hash recipe. This one takes a bit more time, but by that I mean 20 minutes max instead of 10-15. 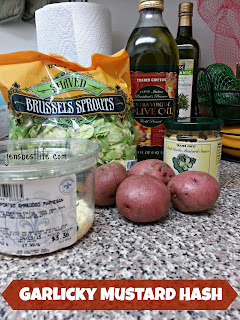 I had made Brussels sprouts with potatoes before, but never with this amazing sauce that Dori clued me in on when she tweeted about it. This sauce is fantastic and really jazzes up this hash! 1. Heat olive oil in skillet over medium heat. While pan heats, chop potatoes into inch-size cubes (precision is not necessary here). 2. Add potatoes to pan. Mix with Garlic Aioli Mustard Sauce. Stir frequently until brown and soft when pressed (about 5-7 minutes). 3. 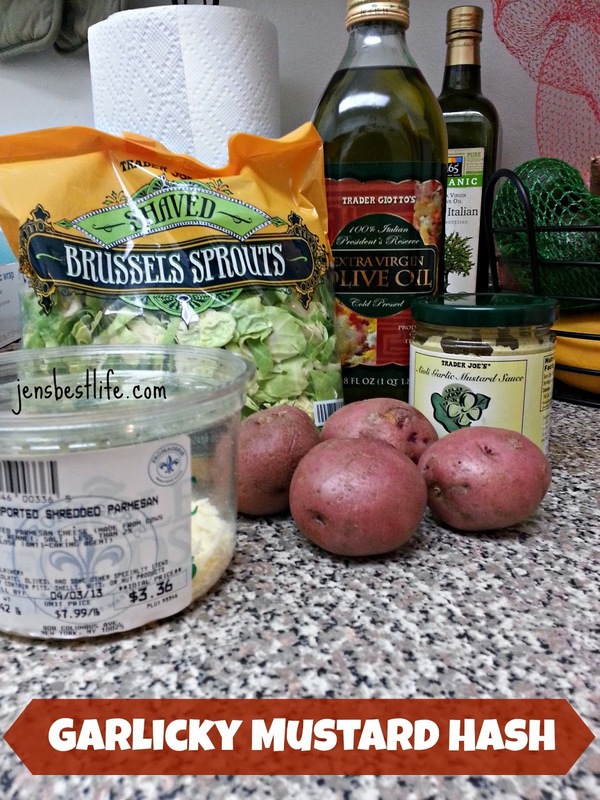 Add package of shaved Brussel's sprouts. Continue stirring until sprouts are crispy and cooked through (about 5-7 minutes). 4. Add parmesan cheese and stir for 1-2 minutes until cheese has melted and browned. I am SO making this!!! The TJ's Garlic Aioli Mustard is the best thing ever. I am forever indebted to you for letting me know about it. AH-MAY-ZING. Yumm looks delicious!! I'm definitely trying that after my next TJs trip. This is a very TJ's-heavy recipe ;) Let me know how you like it! I just discovered my love for Brussels sprouts this winter. I have never tried a hash before. It sounds amazing! Thanks for sharing. I first discovered their magic after having this incredible dish at Alta Restaurant in NYC involving deep fried Brussels sprouts, Granny Smith apples, pistachios, and creme fraiche. 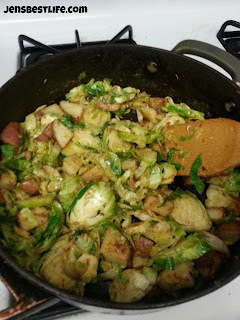 I still make that as a fancy side dish occasionally (roasting the Brussels sprouts) and it's SO good. Haha thanks for getting me through the craziness of TJ's at rush hour! I know, me too! They're one of my favorite veggies.